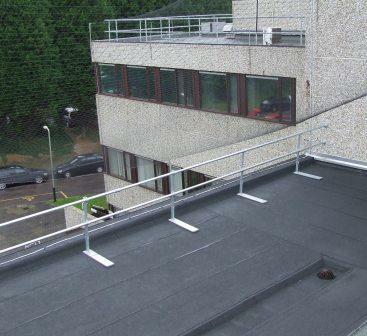 Easyguard is a permanent freestanding handrail system for both retrofit & new build. The system is non-penetrative, alleviating the need for weatherproofing. It is a low profile system, providing minimal trip hazard. The baseplates are fitted with ribbed bonded rubber mats, which include EPDM foam infill, which reduces heat transfer to the membrane. Easyguard is adjustable by up 250mm, improving aesthetics from ground level. The system is designed to BS/EN/SR-15-1988, and compliant to BS6180, for maintenance use BS6399 part 2.